Just when you thought Microsoft had given up on the Zune as a product and had retreated to referring to it as a nebulous cloud of conceptual features, the company comes out with a new device supporting a mobile-optimized OLED screen, a wildly powerful yet super efficient new multi-core Tegra graphics processor and support for high definition radio. The problem is that none of those things are actually true. 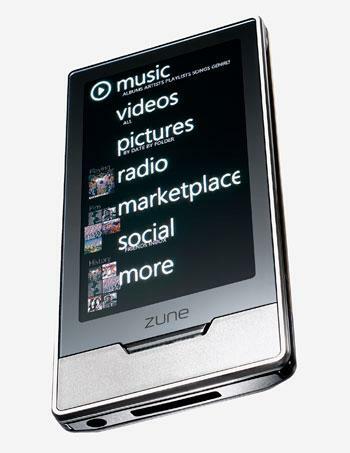 With the Zune HD, Microsoft has dusted off its failed brand and applied it to a new device aimed at the iPod touch. To distinguish it, the company has added several new features. Unfortunately, as was the case with previous models, what Microsoft has added is all sizzle and no steak. Here's why. First off, Microsoft gave the Zune HD a new OLED display. OLED is an interesting new technology that uses a layer of electroluminescent organic compounds, rather than the inorganic materials used in traditional LCDs, to produce an image. OLED panels don't require a backlight, so they can render true blacks and provide a higher contrast ratio. However, today's OLED panels are much dimmer than standard issue LCDs: a typical maximum output of 200cd/m^2 compared to around 4-500 for mid-range LCDs. OLED also performs considerably worse in bright light because OLED is 100% emissive rather than being partially transflective. A good quality LCD actually uses ambient light to make its image brighter and more vibrant; OLED does not. This means when you take it outside, the OLED's screen is completely washed out by sunlight. Unless you only plan to use your mobile device in your dark basement, you don't want one of today's OLED screens, particularly on a mobile media player that you might expect to use on the go in various environments. Microsoft knows this, which is why it only demonstrates the Zune HD in dark rooms. Engadget filmed a full demonstration, including the device's incapacity to pull up a web page, in a suspiciously dark room without even noting this. There are actually candles visibly flickering in the video behind the device. Microsoft sets up its demos in the dark because the Zune HD looks terrible outside, where its contrast ratio advantage observed in ideal conditions completely falls apart. Engadget's other pictures of an OLED-using Sony Walkman show that without the candle-lit smoke and mirrors, OLED blacks are not black at all. There are other problems with OLED. They don't last long, because the electroluminescence layer degrades far more rapidly than regular LCDs. Component colors within OLED also die at different times, with the blue pixels fading first. This results in a rapid shift of the color balance as the device ages. Additionally, the original color reproduction gamut of brand new OLED displays is already worse than standard LCD, resulting in less natural-looking colors from the start that only get worse. And despite the power savings attributed to OLED's backlight-free design, OLEDs still use more power than LCD displays most of the time because the OLED technology consumes power based on how bright the image it is displaying is. Essentially, OLED is the backlight. Sony and Microsoft try to compensate by giving their OLED devices a dark, mostly black user interface. Unless you will exclusively be using your Zune HD to watch gothic movies in the dark, the screen will be gobbling up more power than an LCD. This is particularly the case if you want to browse the web, which involves a lot of white space. Showing a white background, OLED consumes as much as 300% of the power of an LCD. Any colors that rely upon those those fragile blue pixels are particularly power inefficient. "Considering it's got an energy-saving OLED screen, we were disappointed with the battery life of the Jet. Perhaps the powerful processor puts some extra drain on the juice, but the promised 180 minutes of talk time and 250 hours' standby translated into a barely a day of moderate use." If you're wondering why Apple, which sells tens of millions of mobile devices per year and has a component appetite that literally sways RAM markets, didn't beat Microsoft, a company that barely sold a couple million Zunes in two years, to the OLED trough, it's not because Microsoft is on the cutting edge, but because Microsoft is desperately looking for a marketable feature, whether or not that feature makes any sense for consumers. On page 2 of 3: NVIDIA's Tegra processor inside the Zune HD.